Inequality has recently emerged as a central preoccupation in public policy debate. What has driven this is the mounting evidence that in the last three decades there has been a decisive shift towards greater inequality after a period in which inequality was declining. This ‘Inequality Turn’ in the 1980s is one of the most distinctive aspects of contemporary political economy. It was not predicted. The consensus amongst economists and economic historians in the 1950s was that the sharp falls in inequality which had occurred as a result of two world wars and the 1930s slump were permanent and irreversible. Lower inequality was associated with full employment, high rates of growth and productivity, and societies which were both much more prosperous and more socially cohesive than in the past. There have been many important books on inequality in recent years, including Kate Pickett & Richard Wilkinson The Spirit Level, Joseph Stiglitz The Price of Inequality, and Thomas Piketty, Capital in the Twenty first century, which became a rather surprising bestseller in 2014. Now Tony Atkinson has produced a major book of his own. He has worked closely with Piketty in recent years, particularly on assembling long-run data sets on inequality for different countries. But although they are close collaborators there are some important differences between Piketty and Atkinson. They come from different traditions of economic analysis, and Atkinson does not make use of the vivid depiction of different historical eras in the development of inequality which is so marked a feature of Piketty’s work. Atkinson also does not employ the particular formula which Piketty uses to great effect to show that there is an inexorable tendency at work within capitalism to deepen inequality. Atkinson’s approach is instead derived from James Meade. It is a tradition which reaches back to John Stuart Mill and is concerned in particular with the design of institutions that will produce better and fairer economic outcomes. 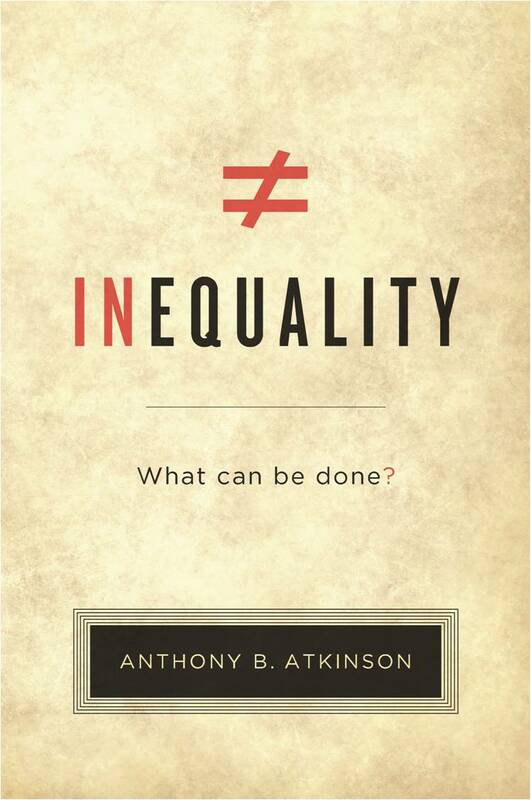 In the first part of the book Atkinson has two aims – to establish the dimensions of the problem and to explain why inequality matters, and specifically why inequality of outcome matters. This concern swims against the mainstream of modern economics, and also Rawlsian political philosophy, with its concern for process and rules, but as Atkinson notes it has a much longer pedigree. Plato for instance argued that no-one should be four times richer than the poorest member of society. Contemporary societies are a long way from that. Currently it is common for CEOs to be paid four hundred times the wage of the lowest paid member of their company. Atkinson acknowledges that he is a heretic, thinking like John Stuart Mill that it is not only important to study how wealth is produced but how it is distributed. This is not the view of Robert Lucas: ‘Of the tendencies that are harmful to sound economics, the most seductive, and in my opinion the most poisonous, is to focus on questions of distribution’. Atkinson’s counter to this is that different patterns of inequality which have been observed historically have a huge impact on social cohesion and poverty, the isolation of the rich in their gated communities as well as the poor in their ghettos. They should be of great interest to economists, and undoubtedly will be to economic historians. The divergence since the 1980s in the patterns of inequality and the generosity of the welfare states in the advanced democracies is marked. Yet those countries like the US and the UK which have seen the greatest widening in inequality have not been rewarded by higher rates of economic growth. Economic growth has been noticeably lower in the last thirty years for all economies than it was in les trentes glorieuses after 1945. Countries with high inequality and less generous welfare states tend to have lower social cohesion and lower trust, but their economic growth is no higher. Atkinson’s conclusion is that what we have witnessed over the last thirty years is not some inexorable fate which decrees that capitalist economies can only function if inequality is high and increasing. It has been a matter of political choice and political preference, and could be reversed. He acknowledges that many of his solutions might seem radical, but that is only in the context of the last thirty years, when a new ideological commonsense took root, particularly in the democracies of Anglo-America. One of its features has been the tolerance of unemployment. Between 1960 and 1973 unemployment averaged 2 per cent in France, 1.9 per cent in the UK and 0.8 per cent in Germany. Between 1990 and 1995 this had risen to 10.7 per cent in France, 8.6 per cent in the UK and 7.1 per cent in Germany. There has been a sharp fall in the wage share in national income since the 1970s, the fiscal base has been eroded, and welfare states have struggled to keep up with the demands placed upon them. 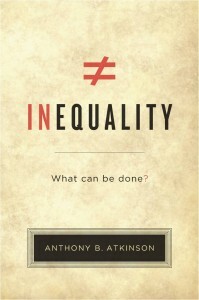 Atkinson does not dispute that there are some structural factors which help explain the move towards greater inequality and which make the task of countering it that much harder. Chief among them are technological change and the changing balance of power in the workplace. But he sees them as a spur to action rather than fatalistic resignation. His fifteen proposals are detailed policy ideas intended to tackle the problem in a number of different ways. No single one on its own is the solution, but if a large number of these ideas were adopted by a reforming government, considerable progress could be made. Among the proposals are measures to ensure that innovations increase rather than decrease employability; redressing the balance of power between labour and capital; full employment policies, including guaranteed public employment at the minimum wage to all those who seek it; a national pay policy which prescribes rules both for the minimum and the maximum wage; progressive income tax rising to 65p in the £, reached at incomes of £200,000, with more intermediate bands (Atkinson argues forcefully that rates of income tax at this level have been in force for nearly half the last hundred years and that the consensus that rates cannot be higher than 40p has no economic justification); capital grants to all at 18; generous social security achieved in part by payment of a participation income to all citizens; inheritance taxes: a public investment authority or sovereign wealth fund, charged with building up the net worth of the state by holding investments in companies and property; and overseas development assistance to be raised to 1 per cent of Gross National Income. It is a powerful and persuasive case, all the better for getting into the detail, and for the careful and precise way the evidence is sifted and conclusions reached. Above all it is hopeful. Atkinson has no time for fatalism. Globalisation is a constraint but it does not prevent action. This book is a fitting summing-up of a research career dedicated to understanding the causes of inequality and to finding ways to counter them. A. B. Atkinson, Inequality: what can be done? (Cambridge, Mass., 2015). This entry was posted in Uncategorised on 5th October 2015 by Grainne Goodwin.